Learn more about our spacious and comfortable rooms. We have queen and king rooms available, as well as apartments and a beach house. 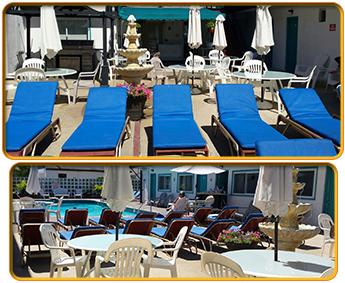 Available each morning and is served poolside in our patio and includes bagels, muffins, coffee, & tea. Stay at a hotel that is close to the exciting boardwalk and beach. At The Amethyst Beach Motel, an exciting nightlife is a short walk away. Thursday nights are a great time to visit the Jersey shore. Jenkinsons has its weekly Firework Extravaganza! Learn about our room packages and early reservation discounts. Amethyst’s Beach Motel, welcomes an opportunity to serve you this summer when visiting Point Pleasant Beach. 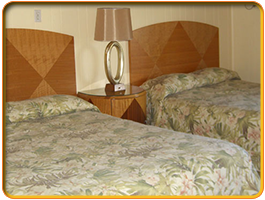 We are sure you will find our motel and its staff to be the finest and our location the best in Point Pleasant Beach. 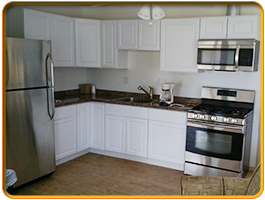 We are located across from Silver Lake and Jenkinson’s Boardwalk, and Amusement park. Just a short distance from the Manasquan Inlet, charter fishing and restaurants. 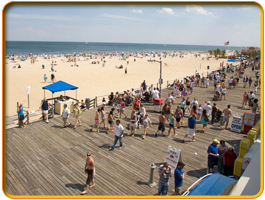 We are also within walking distance to downtown shopping, restaurants, NJ Transit train station and buses, Jenkinson’s Beach, Boardwalk, Aquarium and Amusement Area, as well as downtown shopping, restaurants, coffee houses, and Uncle Vinnies Comedy Club. Favorite Boardwalk attractions, Jenks Club and Martel’s Tiki Bar are all within walking distance and a short drive from Asbury Park, Seaside and nearby Bay head and Spring Lake. Family owned and operated for 50 plus years! keeping with our tradition of making our guests part of our family as they return year after year. For three generations, we have been dedicated to providing you with the best customer service experience possible. Our guests truly become part of our family and return year after year. Our mission is to accommodate every customer and provide a level of customer satisfaction that exceeds your expectations. "I just got off the phone with the always helpful Theresa and made my reservation for this summer. It will be my family's third summer returning to the Amethyst. The motel is clean, affordable, and in a great location. The pool is lovely and the staff is wonderful. I highly recommend anyone stay here!!" "Everything about our stay of 3 nights at this motel was top rate. Love the location - 2 blocks from the beach and 3 blocks from town. We could hear the waves crashing at night through our open window. Great beds, they were the best I've slept on at a motel. Great pool. Quiet and charming."